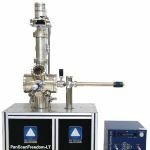 QuadraProbe is an advanced, four-probe, low temperature UHV AFM/STM system from RHK Technology. 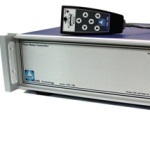 The QuadraProbe is constructed and designed to be a suitable platform for electron transport studies and electrical measurements on devices, for example, carbon nanotubes and nano-wires. 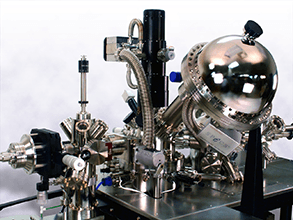 The LT QuadraProbe is a total multi-method, multi-chamber UHV system that uses a cryogenic bath cryostat to consistently cool the four probes and the sample to 10 K (standard) or alternatively to 4-6 K for the most significant Scanning Tunneling Spectroscopy (STS) and transport measurements. The bath cryostat can accomplish up to a 48 hour hold time or more at constant temperatures for a long, continuous analysis. 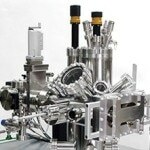 The four probes can be individually positioned, and each one is equipped for atomic resolution. Four STM tips are offered as standard; optionally, any number of these probes can be positioned anywhere between one and four and can be transformed in vacuum to AFM-qPlus sensor for use on conductive or insulating samples. Additionally RHK has formulated various unique specialty applications for the QuadraProbe to widen the flexibility and range of progressive multi-probe experiments that researchers can use. 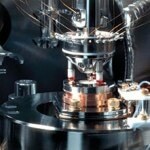 These incorporate using a magnetic field to the sample, coupling microwave signals to the tips and cathode luminescence.